When first dragging and placing a field into the palette area, or clicking on a field already in the palette area, you will notice a popup that is displayed. This popup is the field settings menu and it allows you to do basic things like naming the field and setting restraints, some fields have more complex options that can be a little confusing to understand. This guide will explain the various options that can be set for all field types and provide links to additional resources that give more in-depth information on the option in Fulcrum. Note: The label field type is unique in that it only has one field option, the label. Due to this, it will not be included below. Available on: All field types The label is what is the title of the field. The title is what is displayed on the mobile and web apps for the field. Multiple fields can use the same have the same label. Available on: All fields, except Sections and Repeatable Sections. The description can be used to provide the person in the field with more information. This can be used for instructions or guidance on how to collect data to this field. When a field has a description there will be an ‘i’ icon that is inline with the field label. Available on: Choice fields, Text field, and Numeric field. When a default value is set the value entered will automatically be populated into the field if the field currently has no value. 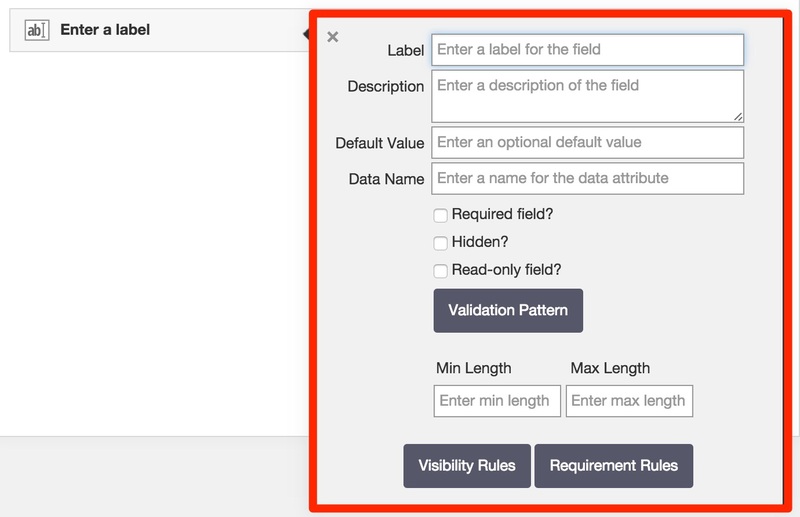 The default value can speed data collection time when the field usually will have the same value captured. Available on: All field types The data name replaces the label when data is exported out of Fulcrum. The Fulcrum system also uses the data names to match up the data to a field. This allows you to provide a field with a new label as long as the original data name is in use without the worry of data loss. The data names for each field must be unique across all fields in an app. The reason for this is that there will be errors in your export file if the two or more fields have the same header. By default, the data name will use the value entered into the label field and replace spaces with underscores. Available on: All field types, except for Sections and Repeatable Sections When enabled the field will be required to contain a value before the record can be saved and synced to the server. This is ideal if you wish ensure that the data collector enters a value for the field. On the mobile devices records can be stored as a draft and will be stored locally on the device until all the required field contain a value. This is helpful if the data collector needs to exit out of the record before they are able to finish collecting all the data for a record. Available on: When enabled the field will be hidden on all platforms. This is good for keeping data that was collected outside of Fulcrum together. Fields set to hidden will be printed on PDF reports. Additionally, calculation fields that are set to be hidden will still run their calculations when the record is opened in the record editor. Available on: When enabled the field will be visible on all platforms, but the field contents cannot be edited within Fulcrum. This allows users to see data that has been seeded into Fulcrum.